After the Travelodge at 285 Great Road closed in early 2012, the owner of Great Road shopping center (who also owns 285 Great Road) submitted plans to replace the motel with a fast food or fast casual restaurant with drive-thru. While the old motel was demolished earlier this year, the location has remained available for lease. It appears the original plans for a drive-thru restaurant have been put on hold. Now it looks like the owner may be exploring other options. According to a recent LoopNet posting, "Owner is proposing a 3600 SF one story office building" at this location. 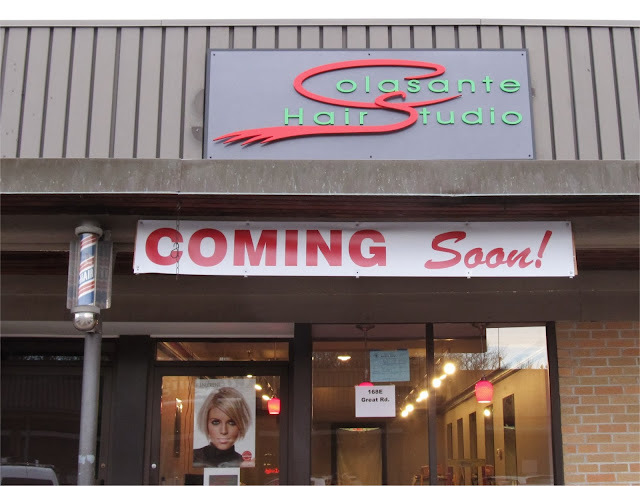 Colasante Hair Studio located at 168 Great Road in the Bedford Marketplace shopping center, opened on Thursday November 14th. As previously reported, the new studio, which has five stylist chairs, has kept the stylists from the former Center Hair Stylist barbershop. The former Center Hair barbershop has undergone an extensive renovation including new lighting and chairs, giving it a more modern appearance. While the Studio is now open, a few remaining finishing touches on the renovation are expected to be wrapped up in the next week or so. Ken's N.Y. Deli at 82 Great Road had it's grand opening on Saturday November 2nd. I recently spoke with James Garabedian, one of the owners. James has been in the restaurant business for over 30 years. He owned the original Ken's NY Deli next to Caldor's in the Middlesex Mall in Burlington. In 1999, the Mall bought his location out. He then moved the restaurant in to a previous McDonald's on Cambridge Street in Burlington (which is now Lesters BBQ). A few years later, he moved to the old building at the Blake Block. He then sold the restaurant to one of the employees. After the old building came down, the new owner could not reach a new agreement with the landlord, so James saw there was an opportunity to re-open Ken's. 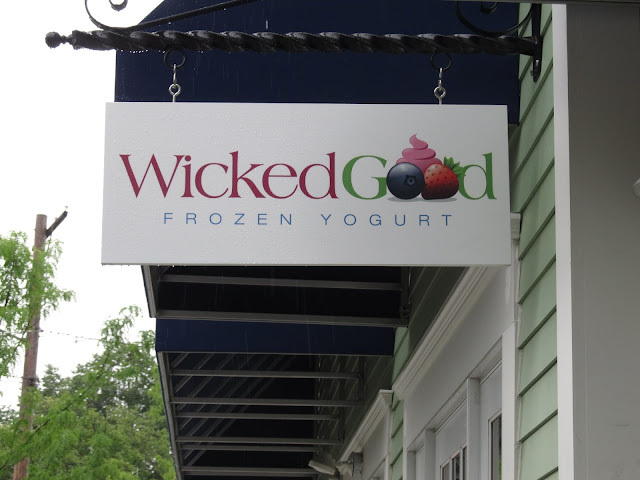 This time he partnered up with co-owners Marie and John Cronin (who also own Wicked Good Frozen Yogurt right next door to Ken's). The new restaurant has 47 seats and includes art work of the New York skyline. James mentioned he loved to cook so his main focus in on the food. The restaurant does not have any microwaves and most items are made from scratch. They get their corn beef from the same supplier as the Carnegie Deli in New York while breads come from a Jewish Bakery in Brookline. Most of the old menu has been brought back along with some new additions including Soups, Pasta Entrees and Brick Oven Pizzas. Their number one specialty is carved turkey. The expanded menu has over 100 items. Please click on the image for a close up view. The deli recently got approved for a Beer and Wine license. They plan to have six different beers on draft along with bottled beer. They are still working on the wine selection, but expect to begin serving beer and wine before the end of the month. The new restaurant is more spacious and includes a number of high top counter seats. The restaurant is open from 10am to 9pm Monday through Thursday, 10 pm on Friday and Saturday and to 2 1 pm on Sundays. Breakfast, including Omelets and Pancakes is available on Saturdays and Sundays. 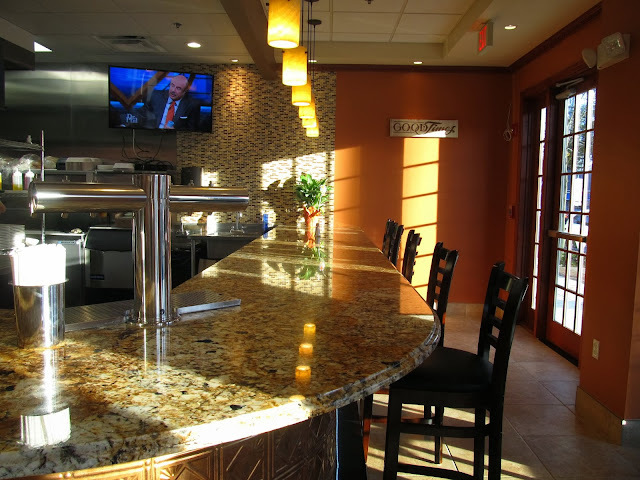 While you normally order at the counter, table service is available on the weekend for both Breakfast and Dinner. Ken's NY Deli on the Blake Block at 82 Great Road is officially opening on 10 am on Friday November 1st. Along with Pizza, Deli Items and Sandwiches, the new restaurant will also serve Beer and Wine. The new restaurant is set to officially open on November 1st at 10 am. 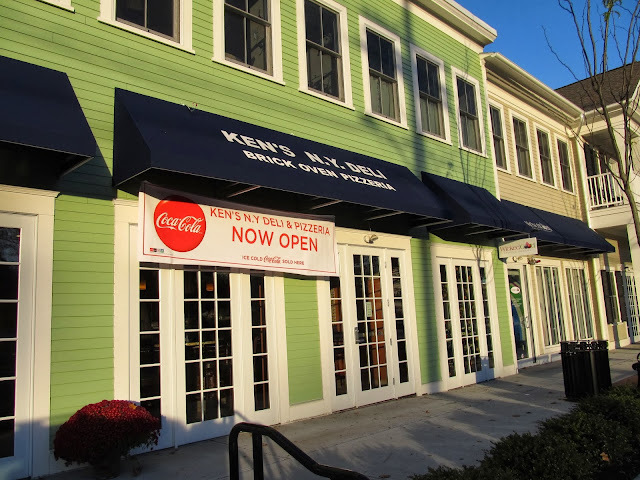 The opening of Ken's represents the last in a string of eight new restaurants that have opened in Bedford during the past 6 months which includes b.Good, Bedford Cupcake, Chipotle's, Ginger, Panera Bread, Subway and Wicked Good Frozen Yogurt. It would be interesting to compare the meals sales tax revenue numbers for Bedford for 2012 with 2013 to see if the new restaurants were able to drive additional customers to Bedford. 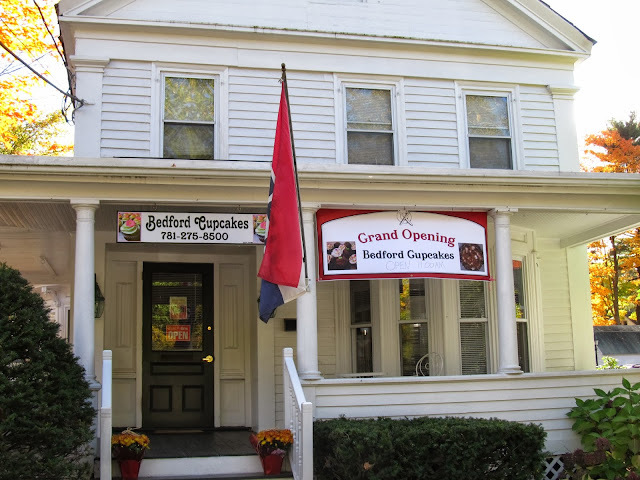 Bedford Cupcakes had it's Grand Opening on October 18th at 119 Great Road. The new restaurant replaced Cafe Keresa which had closed earlier this year. 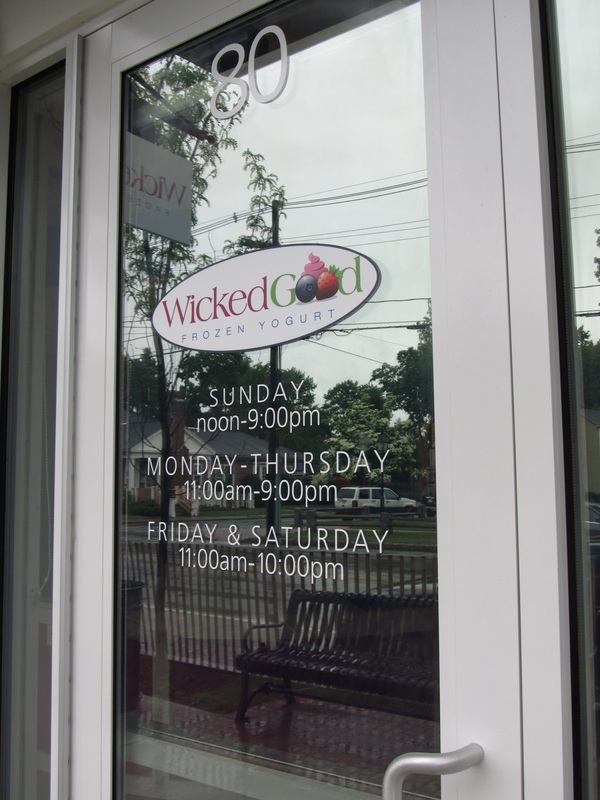 I recently spoke with Lou Hatziandreou, one of the owners. According to Lou, his wife Laura was always interested in baking. A few years ago she got a passion for making cupcakes. Friends and family loved them and keep encouraging her to make more so she starting baking some to to sell at Pizza Express (which is run by Lou's parents) as well as taking catering orders. The demand for the cupcakes began to take off, so Laura started looking in to a dedicated location to sell them. She recently saw the for rent sign at 119 Great Road and decided to take the plunge and open a retail store. 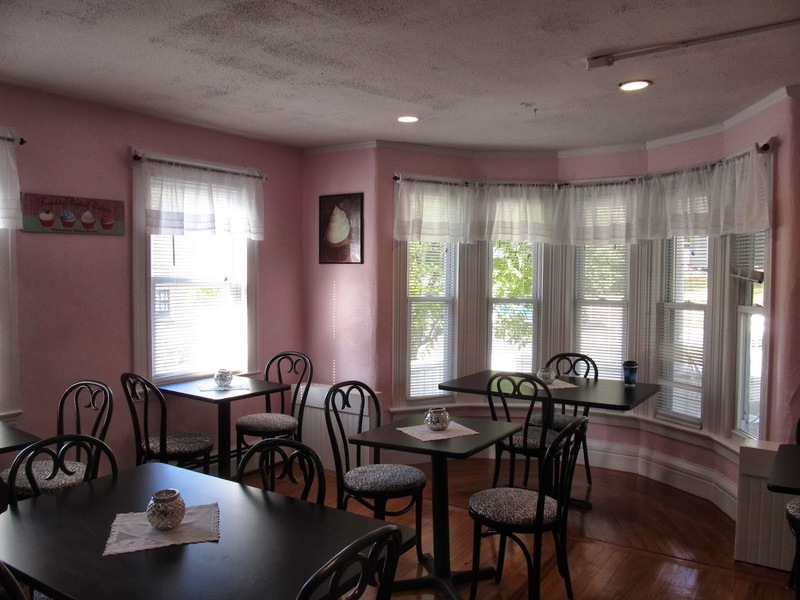 The interior has been updated to reflect more of a cupcake motif. It features 18 seats. Each day features about ten different varieties of cupcakes. Some are long standing and others vary by day. Laura tries new flavors all the time and then repeats what does well. A new website will soon enable visitors to suggest new flavors. Each day features new varieties as well as the traditional classics. Bedford Cupcakes sells cupcakes individually or by the dozen where you can mix and match the exact varieties you would like. While they expect about 90% of the desserts to be cupcakes, they will soon be adding smoothies and plan to offer other items such as Tiramisu. 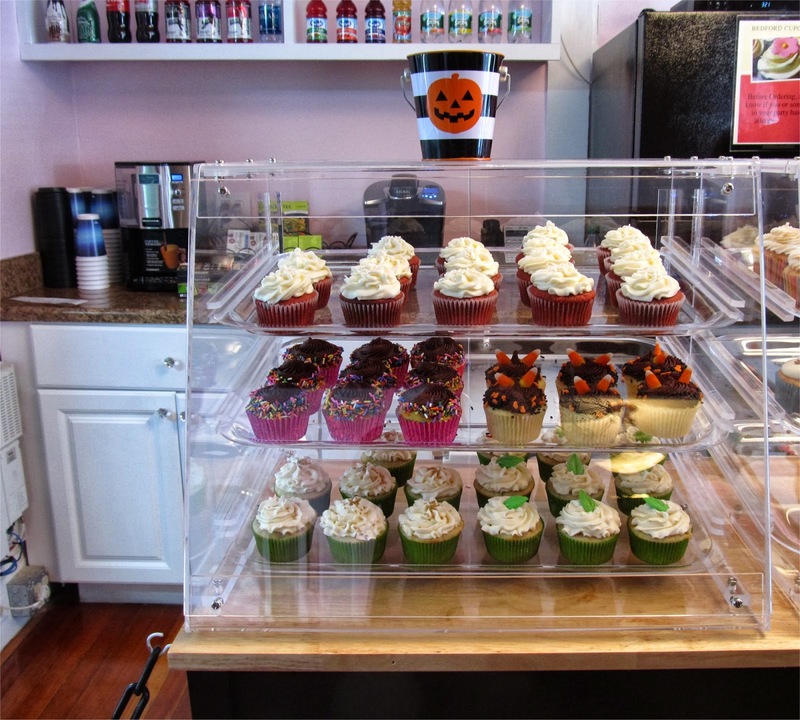 Besides the retail business, Bedford Cupcakes also does catering. They most frequently do Birthdays, Weddings and corporate functions. The store is expected to initially be open Mon-Sat from 11am-7pm and on special events on Sunday. 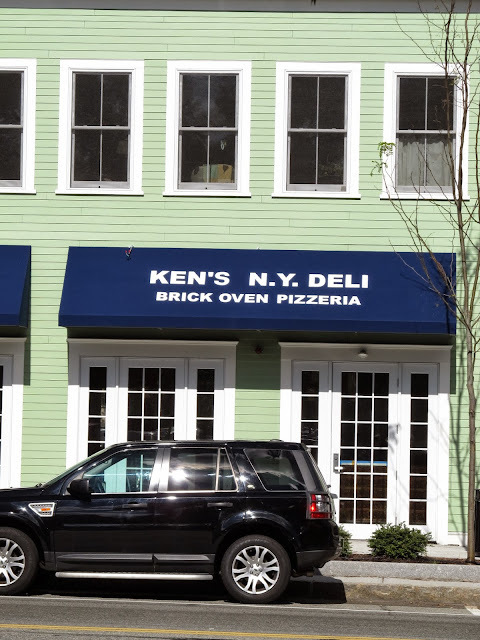 Ken's NY Deli on the Blake Block at 82 Great Road is finally set to reopen later this month. The original restaurant closed in 2011 to make way for the new building. It was originally thought that Ken's would not return, but they ended up signing a new lease. Along with Deli items and sandwiches, the new restaurant will also include a brick oven for Pizza and other items. Colasante Hair Studio at 168 Great Road is now expected to open around October 7th. While the Salon is replacing the Center Hair Stylist barbershop and salon, it's keeping it's old employees. Since the space is undergoing renovation, the previous Center Hair Stylists are temporarily working at Renzo Hair Salon. 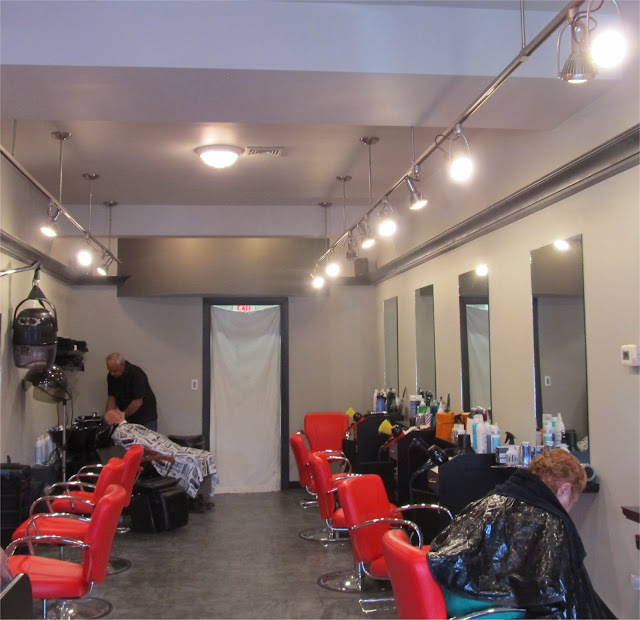 I recently spoke with Pino Colasante, one of the owners of Colasante Hair Studio. Pino has been working at Renzo Hair Salon for the past 36 years (Renzo's has been in Bedford for 38 years). 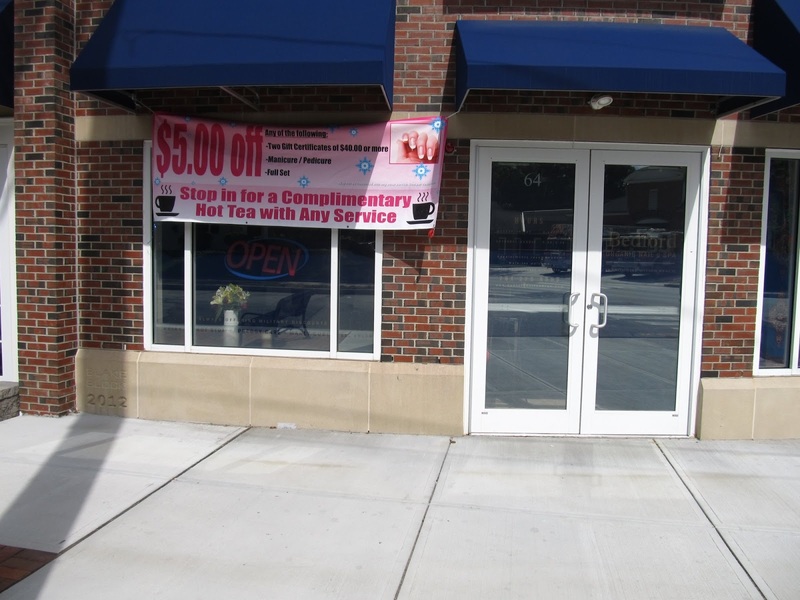 Pino saw a need for another Salon in Bedford, something close to the center of town that has more foot traffic and exposure. The new salon will feature 5 stylist chairs. It will also have high end retail hair products available for sale. Pino indicated he has seen increased demand for Organic products in the past few years. Pino's expertise is in hair coloring. He does a lot of Ombre style hair coloring, where the roots are darker and gradually gets lighter towards the ends. He also makes uses of a French coloring technique called Balayage where the highlights are painted directly on to the hair instead of the traditional foil. To keep hair in good condition, Pino mentioned he frequently makes use of hair color products with protein and uses extra virgin olive oil to condition the hair and keep the color shiny. What Pino is most excited about is offering a roots touch up service for people who get their hair colored. According to Pino, most people get their hair cut about every 6 weeks. However after about 3 weeks, some began to notice hair roots show their original color. At this point, most people either get another cut and color (even though they really don't need a hair cut yet) or they choose to buy hair color products from a grocery store and attempt to touch up their roots at home (which can be a challenge to do it correctly). To address this, the Studio will offer a roots touch up service that is faster (about 30-35 minutes) and costs a lot less than a full cut and color. Pino encourages people to ask him questions about hair. In fact he provides free hair consultations. The new Salon is expected to be open Monday through Saturday. Bedford Cupcakes is expected to open next month at 119 Great Road, the former location of Cafe Keresa which closed this spring. Along with Cupcakes, the new restaurant is expected to feature other desserts such as Tiramisu. Bedford Cupcakes got started about 2 years ago as Custom Cupcakes when they starting providing custom cupcakes catering out of the Pizza Express restaurant on 65 Loomis Street. Along with the catering, they provided cupcakes to sell in the restaurant. The business which is run by the daughter-in-law of the owners of Pizza Express, changed it's name to Cupcake Express Bedford earlier this year and will become Bedford Cupcakes when it opens in October.. 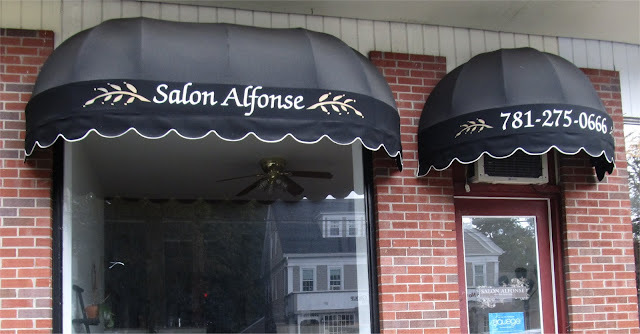 Salon Alfonse which was located at 50 Great Road has closed. The Salon which opened in 1992, had moved to it's current location in 2008. In recent years, the Salon had gradually cut back on it's hours. Alfonse Robles who was the owner of Salon Alfonse, is now working at Salon Reyna in Chelmsford. The space currently used by The Sparta Restaurant located in the Great Road Shopping Center at 337 Great Road appears to be available for lease. According to Conviser Property Group (property manager for the shopping center), the 1200 square foot space will become available for lease in Q4 of this year. Pino Colasane Hair Studio at 168 Great Road in the Bedford Marketplace shopping center is set to open on Monday September 16th. The new hair salon, replaces the Center Hair Stylist that closed on August 31st after 35 years in business. Pino Colasane was previously with Renzo Hair Salon at 428 Great Road in Bedford. Stay tuned for more details. According to documents posted on the Bedford Town Website, B&R LLC is seeking a Used Car License for 50 Concord Road. This is the former location of Bierens Garage. B&R LLC is a Real Estate company managed by Richard and Robert Iovino. Stay tuned for more details. 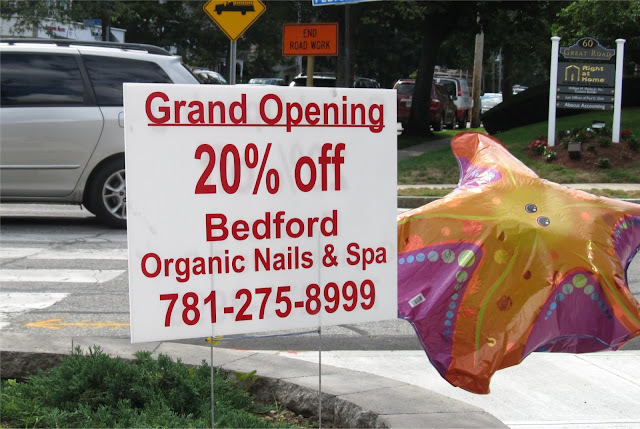 Bedford Organic Nail & Spa at 64 Great Road opened last Friday. 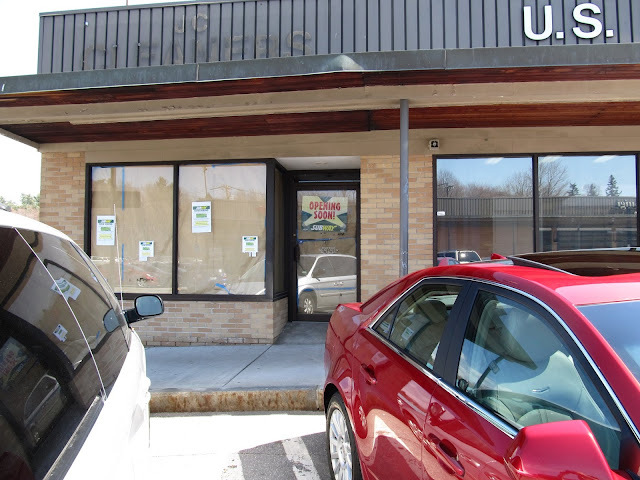 According to staff, this is the third location for the company which also has locations in Billerica and Chelmsford. 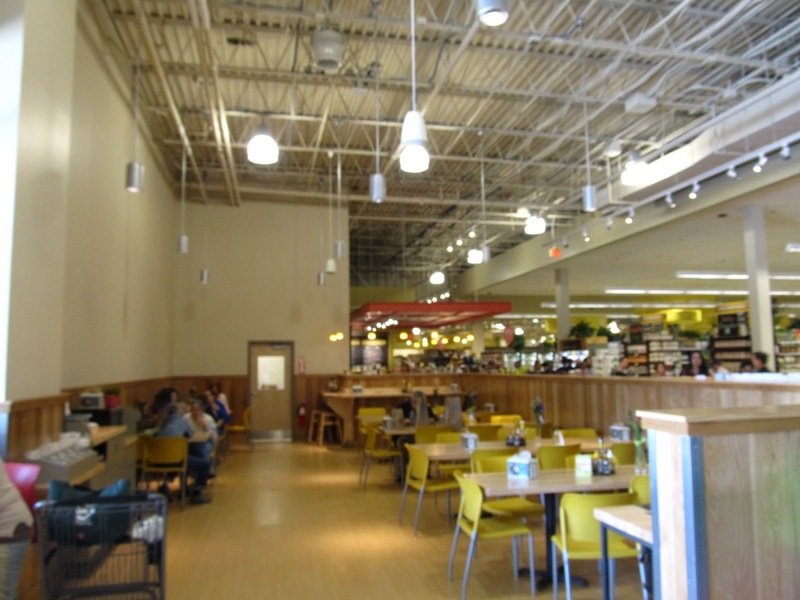 The spa got started about 3 years ago with it's Chelmsford Store. While the Spa opened last week, it's still celebrating it's Grand Opening. 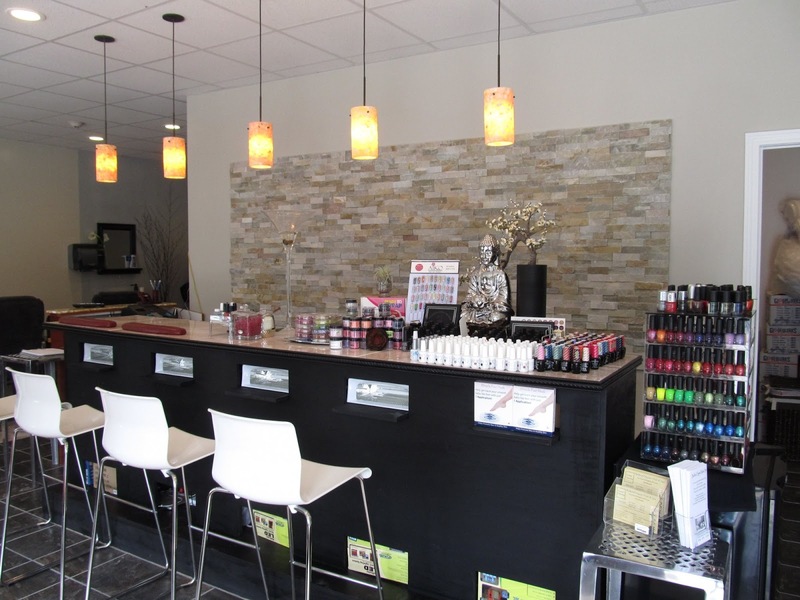 The spa's main focus is on Manicures and Pedicures. However they also offer facials and waxing. The front counter. The spa offers free tea to customers. 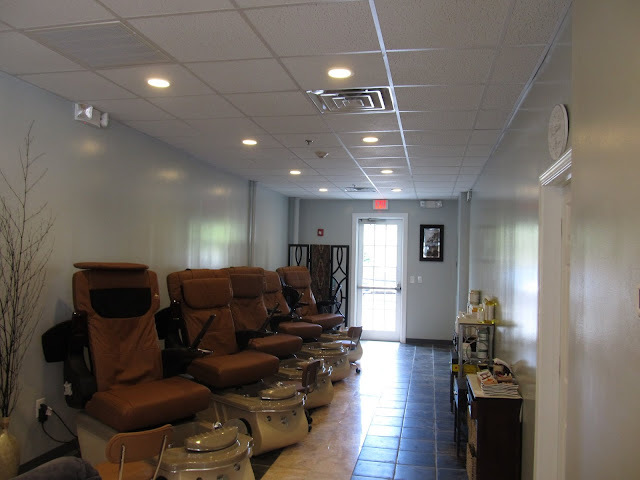 The spa features 5 pedicure chairs. The new spa is open daily from 9:30am to 7:30pm (6:30 pm on Saturdays and Sundays). Quick update on 54 Loomis Street. Construction is expected to start later this summer on this mixed use project. The project which was approved last month, consists of 19 Condos/Apartments spread over two 2 story buildings along with 2860 square feet of retail space. As previously reported, this is the first new project approved in the Depot District. 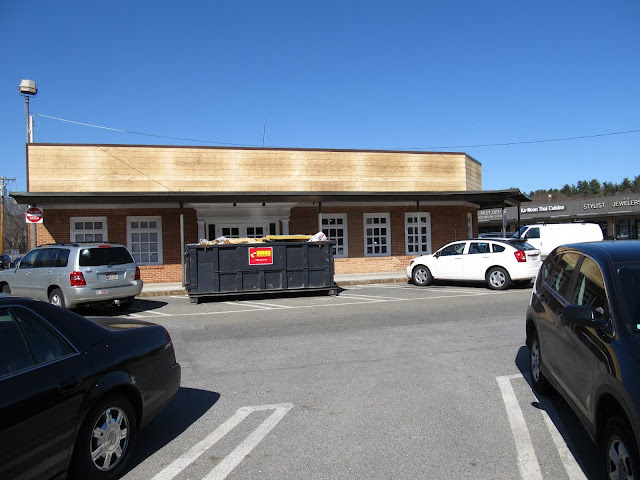 There are also two renovation projects underway in the District; Bikeway Source building at 111 South Road which is adding additional retail space and the office building at 2-8 DeAngelo Drive which was purchased by State Electric Corporation. The first phase of the construction will be the demolition of the existing 12,000 square foot commercial building. b.good at 168 Great Road next to Cafe Luigi in the Bedford Marketplace shopping center has opened. 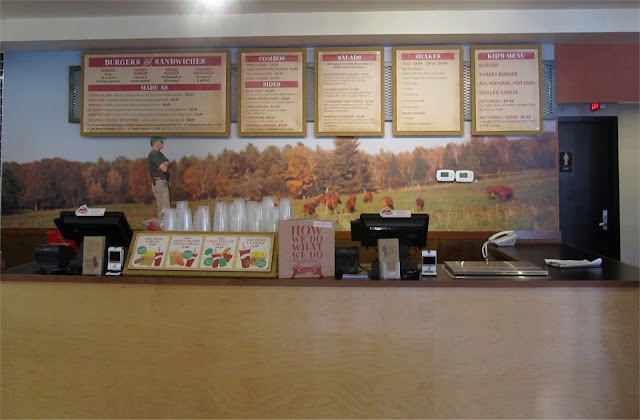 The new restaurant which has 48 seats, is focused on all natural burgers (beef, turkey, chicken and veggie) along with salads, sweet potato fries and shakes. As previously reported, the meat and produce are both locally sourced. 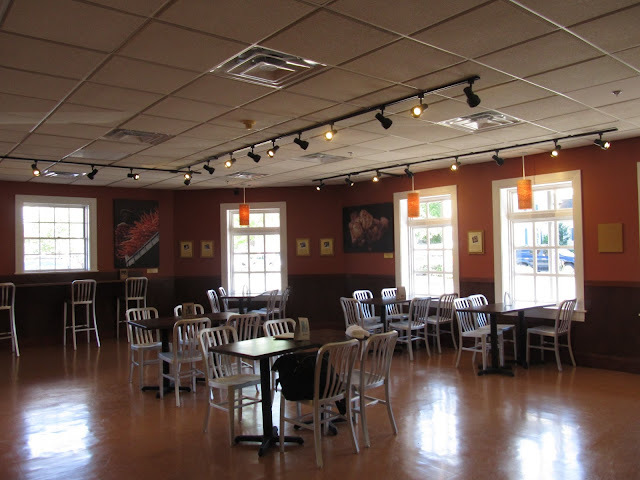 The dining room is a mix of regular and high top seating. This was previously the lobby of Cambridge Savings Bank before it moved across the street. 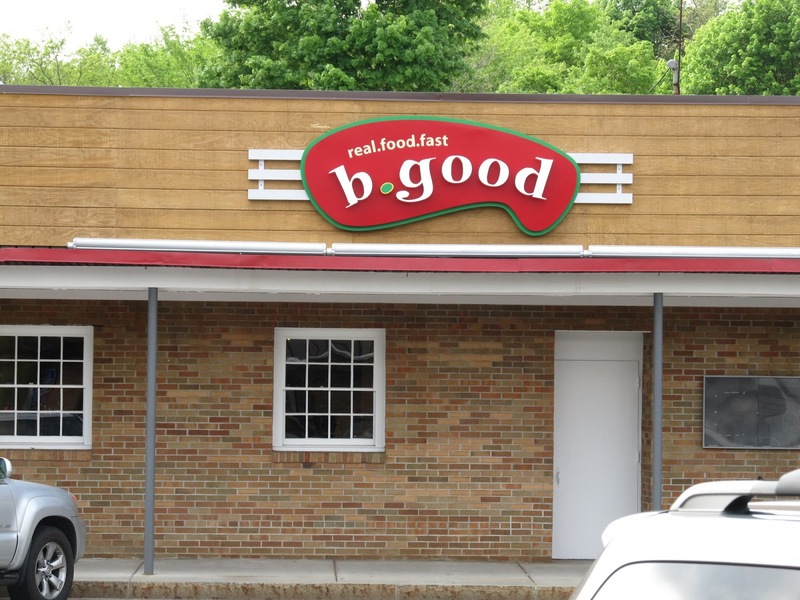 With the Bedford location open, b.good has 11 locations (all in Massachusetts). 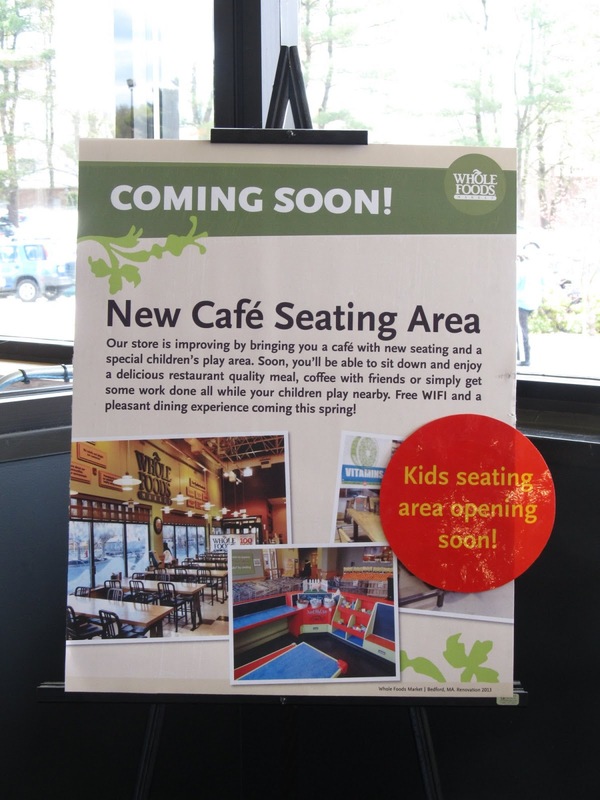 Several more locations (including out of state) are expected to open this summer. Customers can choose from a wide variety of toppings and sauces for thei Burgers such as Gouda Cheese, Avocado, Jalapeno-Ranch and BBQ sauce. Please click on the image to zoom in. The restaurant gets all it's produce from local farms such as Lanni Orchards which is located in Lunenburg Massachusetts. 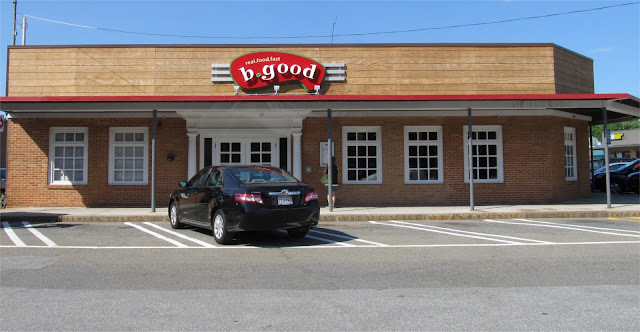 Before it opened, b.good provided lunch to Bedford High School students on June 4th and lunch to Bedford Middle School students on June 14th. This helped build buzz for there grand opening party which I estimate served close to 1000 people. 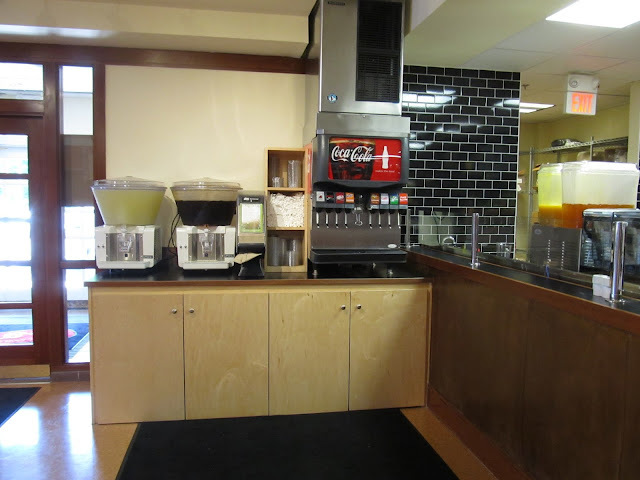 The self service drink station includes Soda's, Ice Tea and Lemonade. b.good is open for lunch and dinner every day. 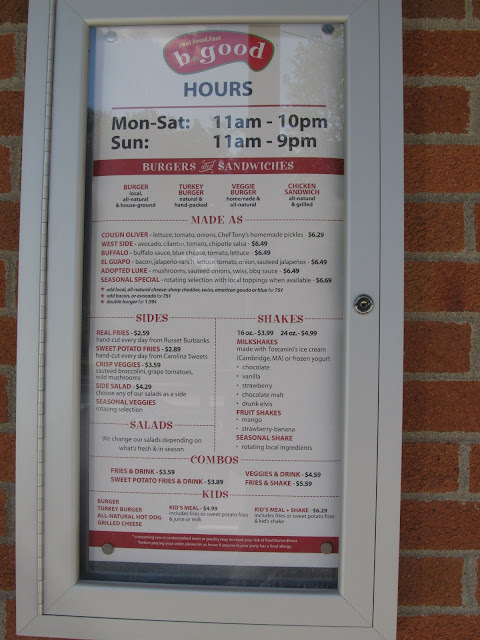 The menu is displayed outside the entrance which is a rarity in Bedford. 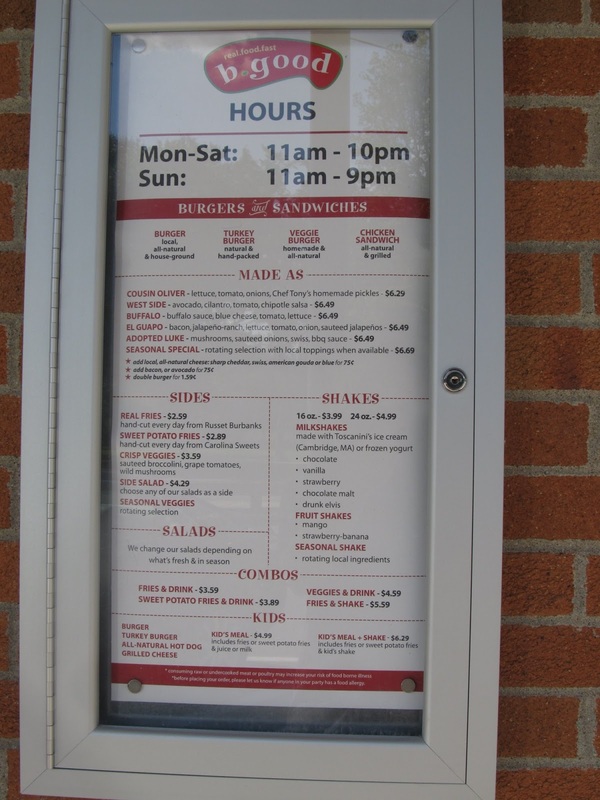 However this enables people to check it out when the restaurant is closed. 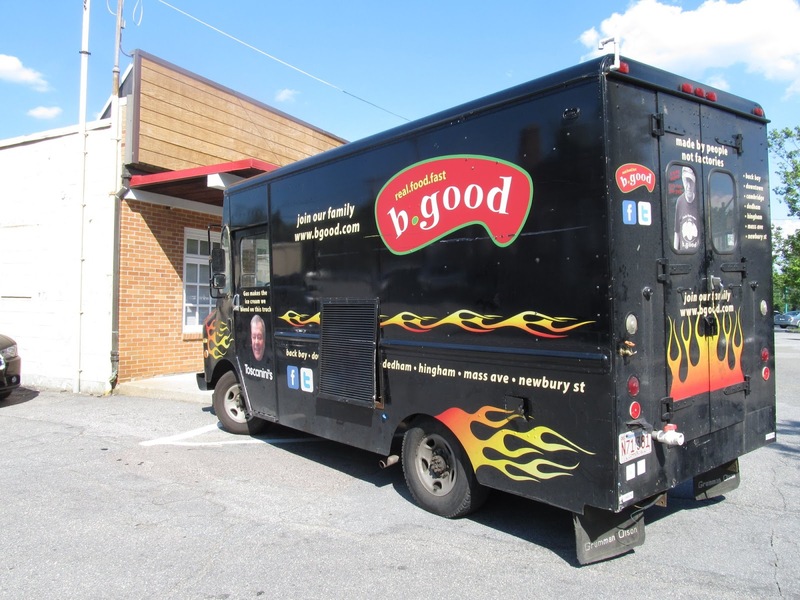 To help promote there restaurants b.good has a truck that drives around offering free shakes in areas where they will soon open a restaurant. 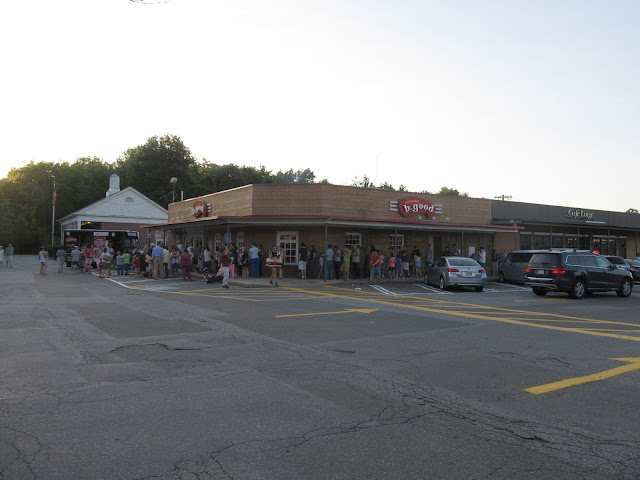 b.good held a grand opening party where it gave away free food and shakes for 2 hours. They also had games and live music. Providing lunch to Bedford Students seems to be smart marketing. I'm sure many of the students told their parents if they liked the food. This seems like a cost effective way to reach a large portion of town residents. And there their shake truck is going to different office parks to reach people who work in Bedford. Rather then send a mailer or place advertisements talking about how good their food is, they made use of personal testimonials. 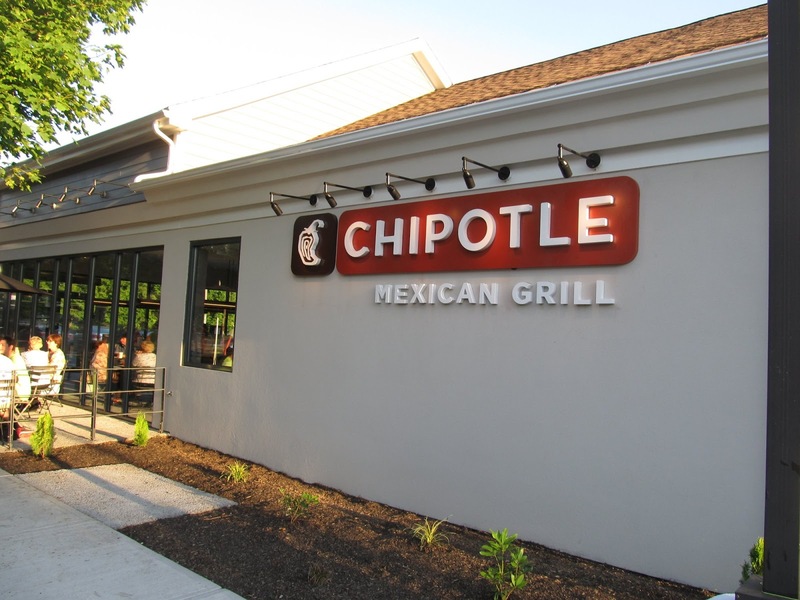 The Chipotle Mexican Grill at 301 Great Road opened today. The new restaurant which has been under construction for several months, has 50 indoor and 12 outdoor seats. It's open 7 days a week from 11am to 10pm. While the main footprint of the building has stayed the same, it no longer looks like a Friendly's. Chipotle's opened it's first restaurant 20 years ago in Denver, expanded outside Colorado in 1999 and now has almost 1500 locations across the United States and parts of Europe. Chipotle's focus is to provide sustainable raised food and natural ingredients. They source their pork and chicken from farmers that raise their animals without any antibiotics. 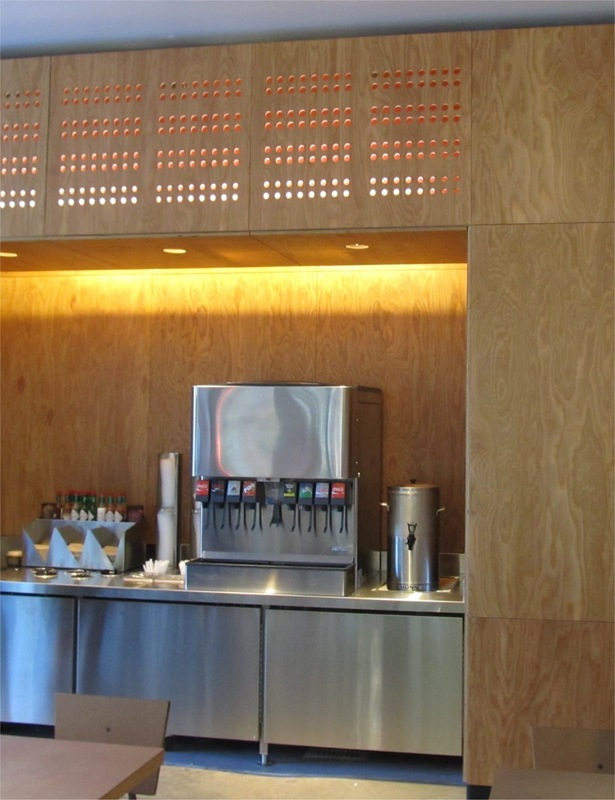 According to Chipolte's management, everything is chopped, prepared and cooked onsite. The restaurant does not have any freezers or microwaves. The outdoor patio features small stones that appear to be glued together providing the look of crushed stoned without having any stone dust track in to the restaurant. The self service beverage area features an assortment of soda and Iced Tea. Beer will also be sold once the beer and wine license gets it's final approval. With all the new restaurants in town (b.good is now scheduled to open on June 22nd), there is going to be more competition. However I think overall there will be an increase in the total amount of money spent in Bedford restaurants as some people who previously ate in Lexington or Burlington can get what they want closer. At the end of the year, it would be interesting to take a look at the total sales tax received from meals in Bedford for 2013 and compare it to 2012 and see how much it increased. Chipolte's has expanded in to Massachusetts in the past few years. It will be interesting to see if their New Southeast Asian concept, ShopHouse makes any inroads. Wicked Good Frozen Yogurt at 80 Great Road opened on June 10th. The new shop, which has about 20 seats, is the second restaurant to open on the Blake Block (with two more to go). I recently spoke with Maria Cronin co-owner who is also a Bedford resident. According to Maria, she did not have any initial interest in Frozen Yogurt, but keep seeing a lot of Frozen Yogurt shops open in other towns such as Lexington. 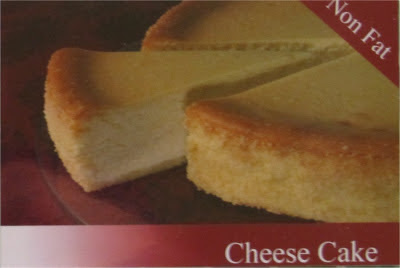 They seemed to do very well. She did not see any in Bedford, so she decided to open one herself. a cup with the flavor(s) they want. There are five machines for a total of 15 distinctive flavors. Once the customer has added the Frozen Yogurt in to the supplied cups, they can also choose to pile on up to 20 different toppings and flavorings such as Hot Fudge, Strawberries or Candy Pieces. The final price is determined by weight, in this case the number of ounces. A view of the toppings bar. 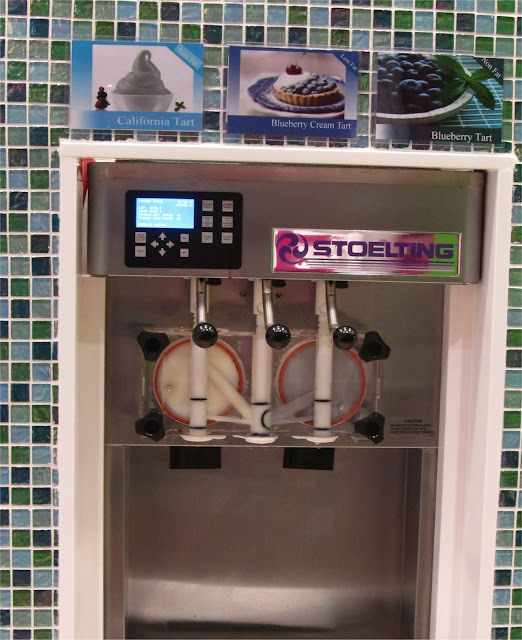 The Frozen Yogurt can also be made in to Smoothies. The new shop is open until 9 or 10 pm every day. Both Burlington and Lexington have added multiple Self Serve Frozen Yogurt shops in the past year. This is the first one for Bedford. This appears to fill the void left when Friendly's closed. 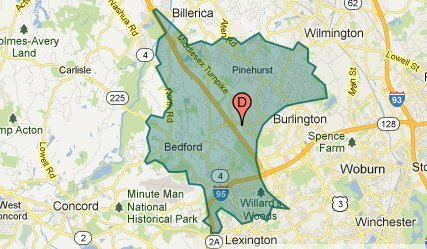 It will be interesting to see how much overlap it will have with Bedford Farms. 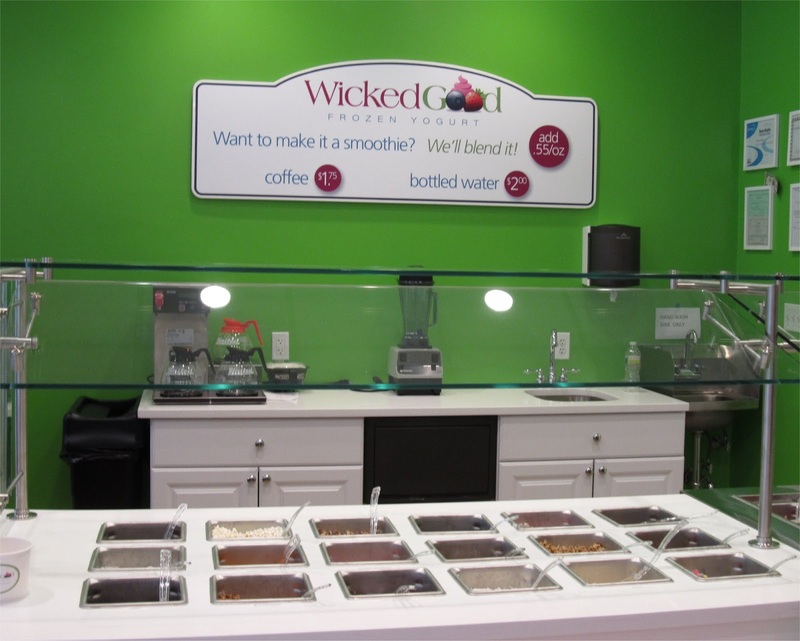 For more about the recent expansion of the Frozen Yogurt Market, check out this article. Wicked Good Frozen Yogurt on the Blake Block at 80 Great Road is expected to open on Monday. 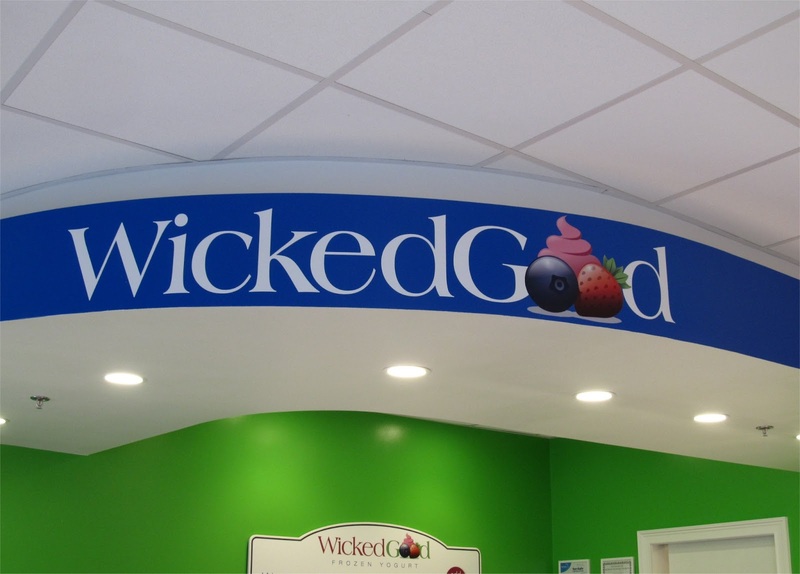 The new Yogurt shop is expected to offer 10 different flavors of Frozen Yogurt along with a mix of toppings that you can add in. The store will be open until 9 pm during the week and 10pm on Friday and Saturday. 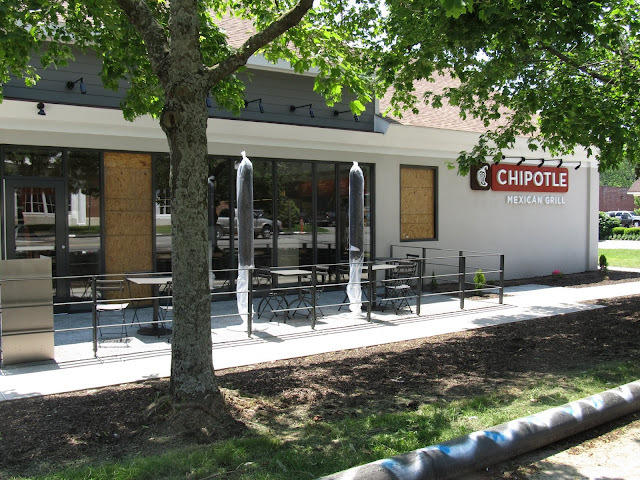 The Chipotle Mexican Grill at 301 Great Road is expected to open within the next few weeks. The new restaurant replaces the Friendly's that closed in January of 2012. The building has undergone extensive renovation. 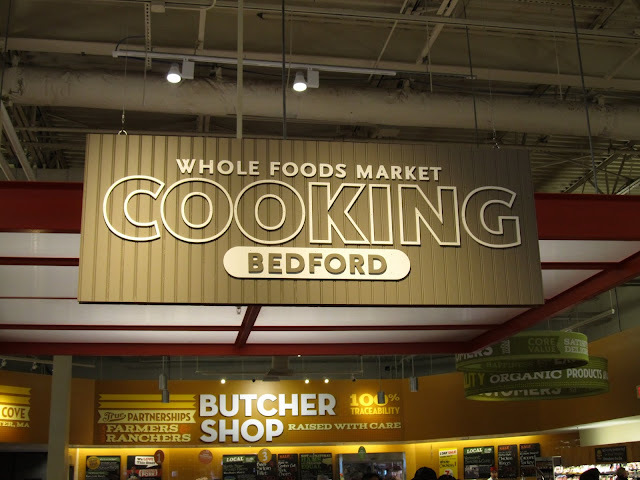 While there are Chipolte's in Burlington and Woburn, the Bedford location will be the only one in the immediate area that sells beer in addition to the regular menu items. 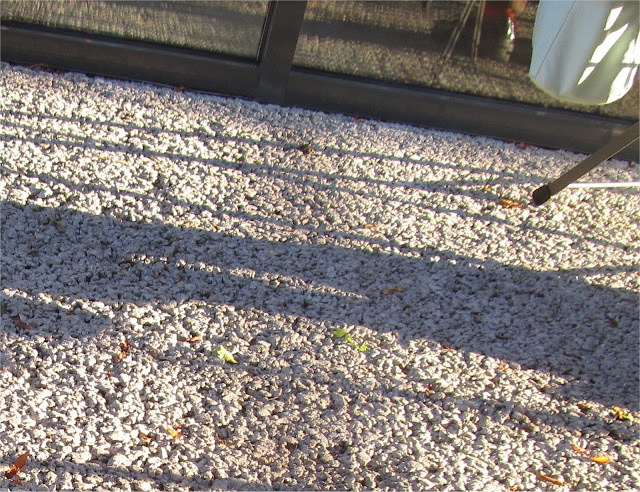 The restaurant also features an outdoor patio. What's interesting is that while the building did not move, the address changed from 343 Great Road to 301 Great Road. I'm guessing this is a deliberate attempt by Chipotle to ensure that old online information about Friendly's does not get associated with the new restaurant. The Whole Foods in Bedford Marketplace has just completed a Multi-Million Dollar interior renovation. As previously reported, the renovation included; an expanded salad bar, a soup and rotisserie chicken station, a new sit down coffee and juice bar, a new cooking department as well as an expanded cafe seating area with a children's play area. 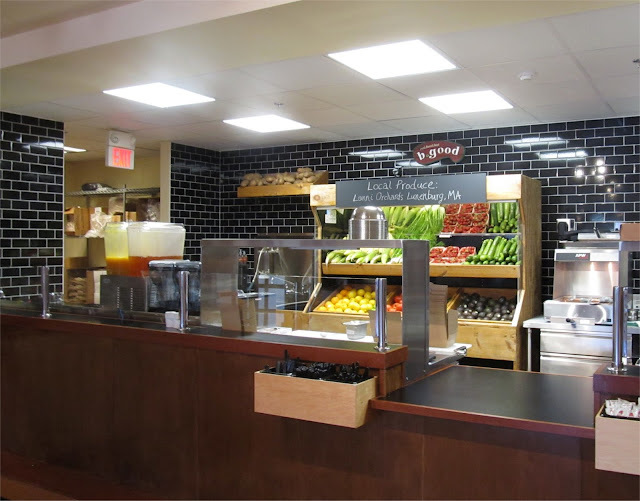 The new cooking department holds cooking demos and also features cooking coaches giving advice to customers about recipes and how to make specific dishes. The new seating area is larger and has a more open air feel. The Kid's play area is expected to open soon. 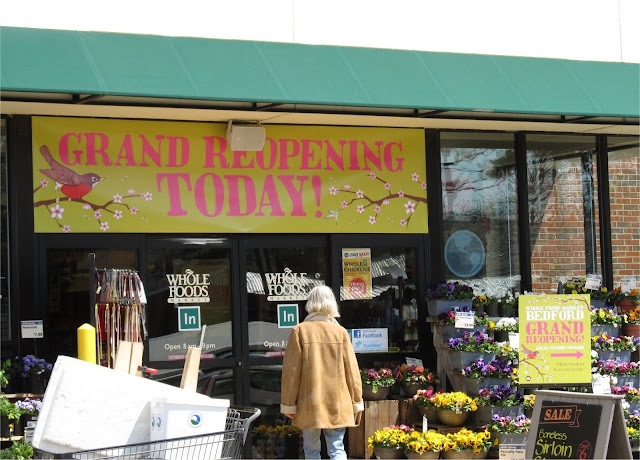 As part of the Grand Reopening, Bedford Whole Foods set up a vendors area outside with free food and promotions for customers. 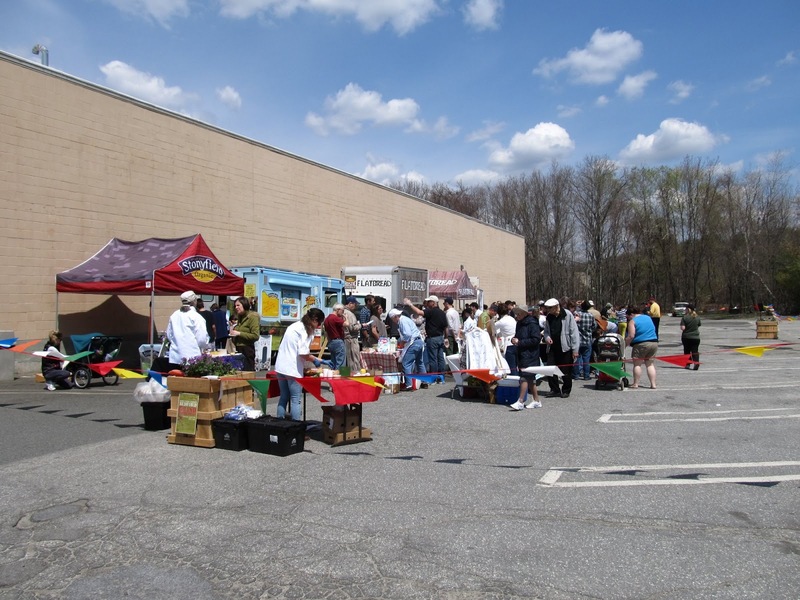 The vendors area featured free samples, cooking demonstrations, coupons and more. The vendors area was a good idea. Rather than just promoting itself, Whole Foods made the decision to make it's vendors the focus of the Grand Reopening. This gave the opportunity for customers and vendors to directly talk to each other. The Panera Bread at 213 Burlington Road is set to Open on May 1st. 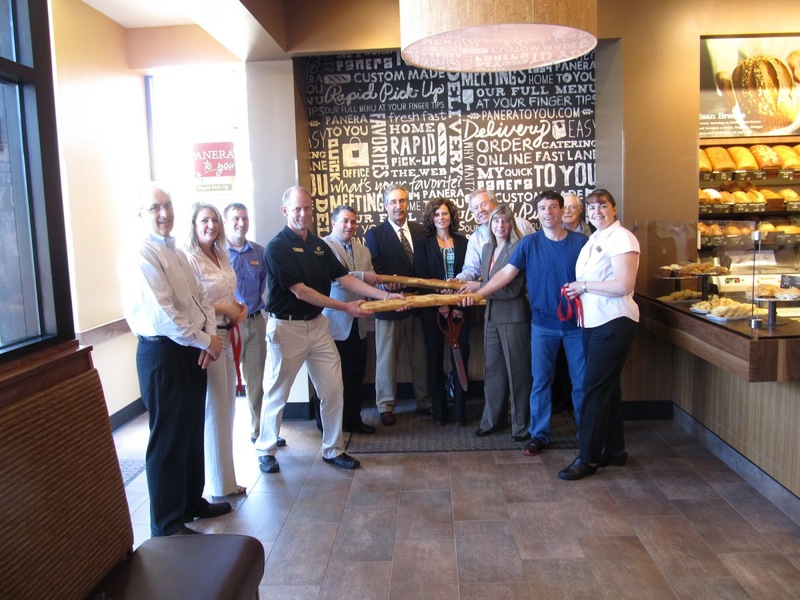 While not "Officially" open, Panera Bread held a benefit to raise money for Bedford High School on April 24th. 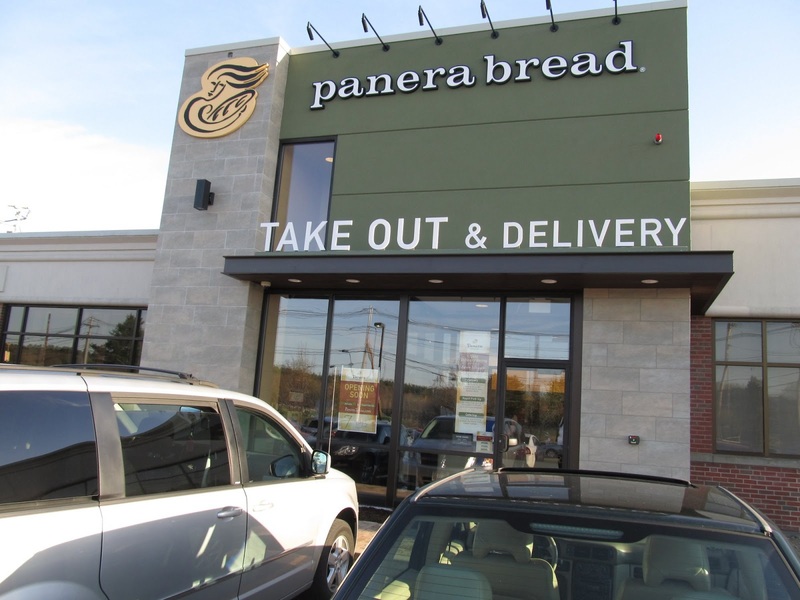 The new Panera Bread, which joins 3 other restaurants (Bamboo, Flatbread and Melting Pot) in the building, is primarily focused on take out and delivery. This is a new concept for Panera Bread. 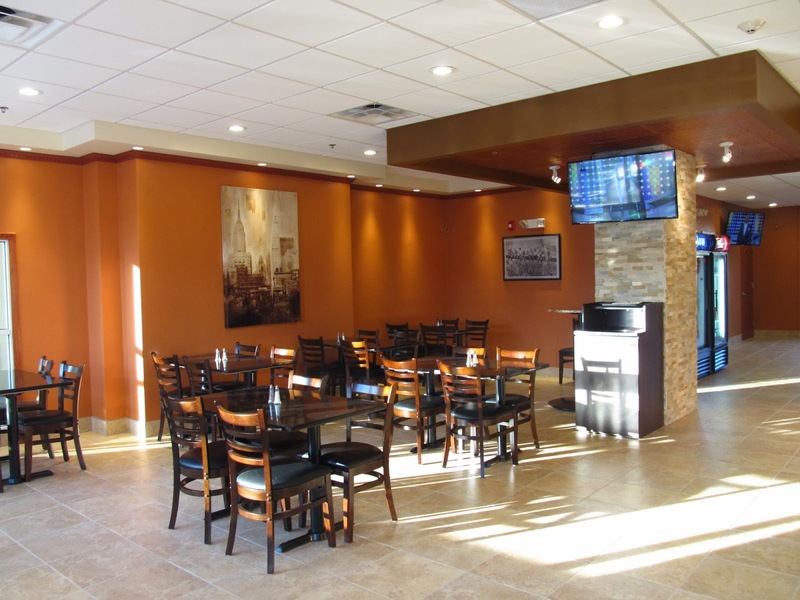 For customers who want to eat in, there is now a common lobby area with seating that is open to the public. The restaurant is scheduled to be open from 6am-10pm (Sundays 7am-9pm). As part of the agreement to open, the property owner added 48 additional parking spaces in front of the building. 1. This building has become a mini-hub for restaurants. It will be interesting to see if these restaurants drive more retail to the building or nearby areas. For example there are vacant office buildings a few doors down, would be interesting to see an extended hotel come in. 2. The common seating area seems like a good idea and may encourage more business for the restaurants. You could have a few people pick up lunch at the different restaurants (or even bring their own) and then get together to eat. 3. 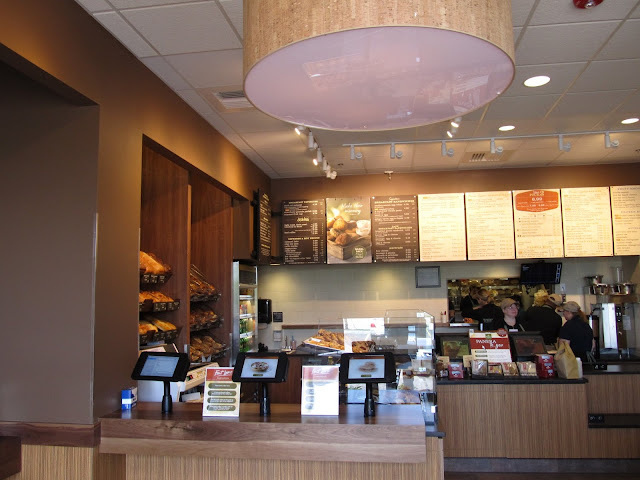 It will be interesting to see how well this concept works for Panera Bread. With all the businesses nearby and right off route 3, it looks like they picked a good location to test. 4. The new parking spaces seem like it will also benefit Melting Pot. Previously the closest place to park for Melting Pot was in the garage next door (209 Burlington Road). Bedford Rugs has returned to the Blake Block. After relocating in the fall of 2011 to 200 Great Road, the store has moved back to 68 Great Road. I recently spoke with Mohammad Nazir, the owner of Bedford Rug. According to Mohammad, while he made the move back last week, he's still settling in and he expects the layout of the store to be complete in the next few days. Bedford Rugs features both handwoven and machine made rugs. In addition to selling rugs, they also clean and restore them. Mohammad thinks his new location has a lot more visibility and he also expects to pick up some additional foot traffic as the other retailers on the block open up. He's currently planning on staying open Monday through Saturday and half the day on Sunday. 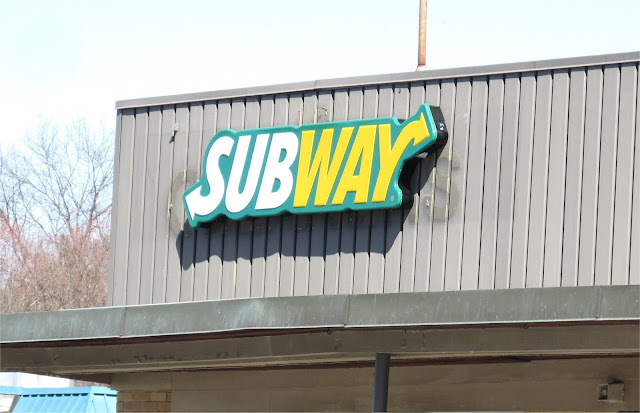 Construction of the Subway Restaurant at 170 Great Road in Bedford Marketplace is almost complete. 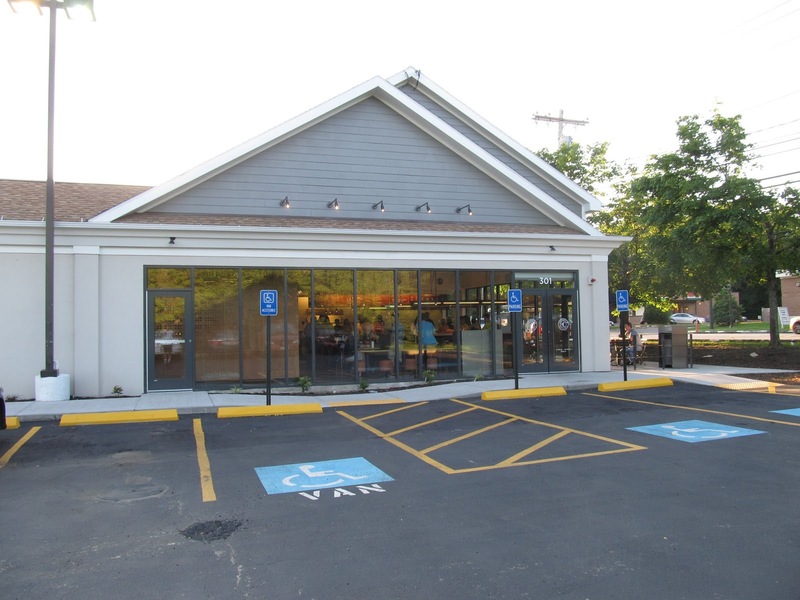 According to Franchise owners Harshil Parikh and Niral Ghandi, the new restaurant, which is replacing a Verizon store is expected to open around May 4th. They are planning a lot of promotions in the first three months. While they have a lot of experience in the hotel and hospitality industry, this will be their first Subway franchise. Interior construction is just abut complete. While there is still some remaining outside cleanup and signage, the restaurant is expected to open in a few weeks. Harshil mentioned they are looking forward to becoming actively involved within the Bedford Community and are planning some special recycling efforts. 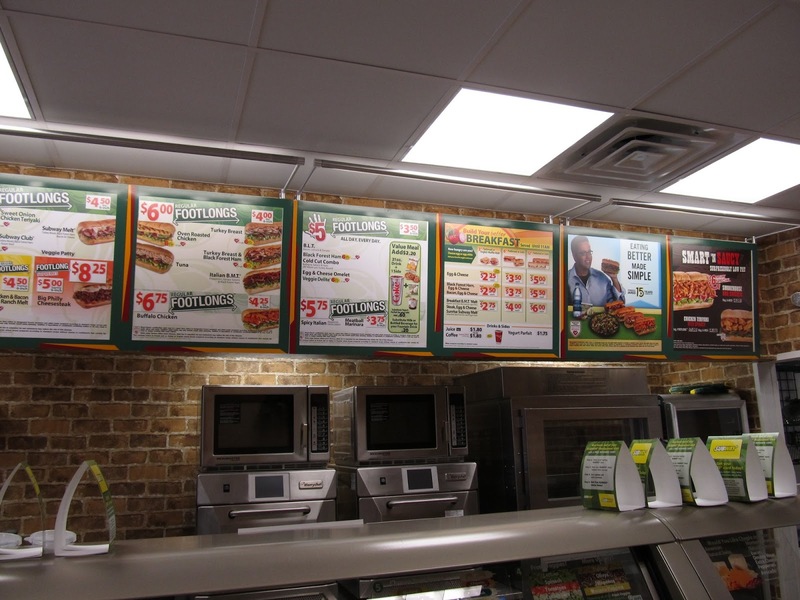 There are currently five Subways in Burlington and three in Billerica. This is one of two new restaurants coming to Bedford Marketplace. Work has just started on another restaurant across the parking lot. 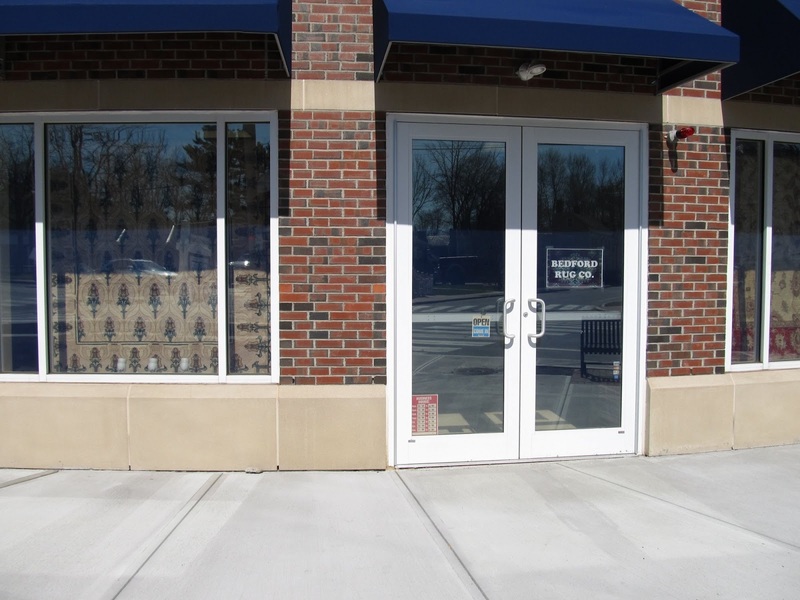 The former Cambridge Savings Bank will become a b.good, which is a fast casual restaurant focusing on Burgers, Salads and Shakes.